B.C.’s museums, galleries and historic places are wonderful spaces for families. Thanks to the Province of British Columbia, the following organizations are offering free Family Day events that will provide fun ways for kids, parents, grandparents and everyone in between to learn more about local cultural heritage and engage with arts and culture. Browse the Family Day event calendar and find out what your local museum has to offer! NOTE: Due to inclement weather, some institutions may need to reschedule events, so please check this website often to confirm dates and times. Fun FREE Family Day Extravaganza @The Reach! Experience our national and provincial award-winning Voices of the Valley museum exhibition with tour guides; participate in What's Our Story? hands-on Artifacts Stories Workshop (Is it the artifact's or the visitor's story?) with storyteller Kris Foulds, Curator of Historical Collections. Learn to Create your Own Family Tree Art Project with Anna Williams, The Reach's Curator of Learning and Community Engagement, view our amazing current art exhibitions and enjoy refreshments and music. Join us on Family Day to kick off our Heritage Week events! Come and preview our main gallery renovation, share your stories that are unique to you, and learn a little more about the history of your community! Bring your family to complete our historic in-museum Scavenger Hunt and enter our Family Heritage Portrait Contest using our exhibits as backdrops! The Ashcroft Museum and Ashcroft Heritage Committee invite everyone to a free movie afternoon at the Ashcroft HUB. What better way to spend Family Day than watching a movie complete with popcorn, drinks and an activity sponsored by the museum. Doors open at 1:30 pm. See you there! Barkerville's Historic Main Street will re-open for a special Family Day weekend event! Travel back in time with our historic interpreters, compete in heritage games, and visit exhibits and shops opened just for the weekend. Join us Saturday, Sunday, and Monday, February 16th -18th, from 11 am to 4 pm at Barkerville Historic Town and Park. Drop by the Japanese Culture Corner for a lively and relaxing Saturday! Learn to play Japanese board games like Shogi, make Japanese-inspired arts and crafts, or just hang out and visit with coffee and tea. Lake Babine Nation will be hosting, FREE 2019 Family Fun Activities, at the Margaret Patrick Memorial Center on February 18, 2019 from 10:00 AM to 3:00 PM. There will be free hot dogs, hot chocolate Healthy snacks [celery, carrots, cucumbers] and bottled water. There will snowmobile rides at 11:00 AM to 12:00 PM and 2:00 PM to 3:00 PM. Inside activities will be include face water color painting for all children, booth for Babine Carrier Language, and Baby Toddler Crawling contest. 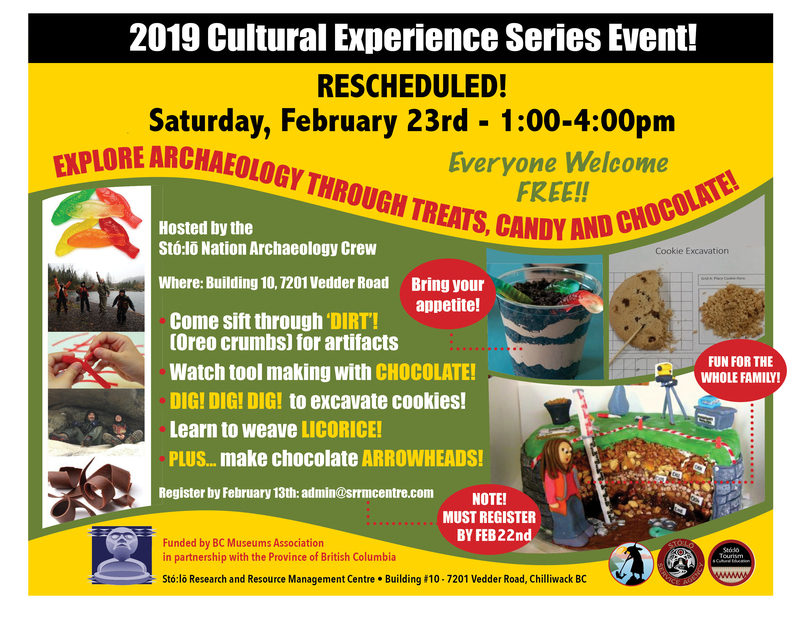 Come join the Sto:lo Research and Resource Centre for an afternoon of experiencing archaeology through food. REGISTRATION IS REQUIRED FOR THIS EVENT. Join us at the Museum for a child friendly display featuring toys and clothes through the ages including the 'horseless carriage.' Explore this window into a different world. Children are welcome to use their artistic skills and create their own ideas as inspired by the display. Join the Filberg Heritage Lodge and Park Association for a Family Day open house. Historical displays, demonstrations, entertainment and refreshments , free admission, Monday February 18, 2019 11 am to 4 pm. Join us at the Creston & District Community Complex as we create the Family Day Memory Quilt! Draw your favourite family memory on a piece of fabric, tell us the story about it, and then help the Creston Museum put it together with other family memories in a very special quilt. The Fernie Museum is please to welcome families from across BC and Canada to Fernie throughout the Family Day weekend. We will be offering free admission, hot chocolate and a museum scavenger hunt. Join cultural teacher and storyteller, Fern Gabriel for an educational and entertaining walk as she shares Kwantlen's rich history, including traditional knowledge and stories. Traditional songs will be shared through drumming and singing. The group will meet outside of the Cafe. Visit the Fort St. John North Peace Museum for a Family Day open house. Historical displays, children's activities, refreshments, free admission, Monday February 18, 2019 11 am to 2 pm. Family Day of Activities where the children can have fun with their parents/guardians and then an evening event of celebration of our families. We will sit and share a meal together which is the ways of our ancestors. Join us for an Interactive Families Exhibit at The Boundary Museum & Interpretive Center for our Family Day Kick-off event on February 15th, 10:00 am to 3:00 pm., where the visitors participate and help create pictures of their own family to add to the exhibit. We gratefully acknowledge the support of this event by the Province of British Columbia. Join us at Gallery 2 for Art Engage this Family Day weekend. Stay warm and dry while interacting with the various exhibits and participate in various guided art activities or explore your own creativity. Activities are appropriate for the whole family to enjoy. Bring the whole family for Family Fun Day and join our all ages art party! Enjoy live music, snacks and family-friendly exhibition tours. Make your own buttons to share with friends, create props and pose in a tableau vivant and contribute to our collaborative chalk mural. This event is FREE and open to all. This February 18th, 2019, join us at the Kelowna Art Gallery for free admission to our current exhibitions. We are also offering family-friendly tours at 11am and 2pm of our exhibitions. The Gallery's Art Lab will be open for a fun filled day of creative expression and art exploration. Our Lives Through Our Eyes: Nk'Mip Children's Art Visit us on Family Day to experience this important temporary exhibition of children's art from the Nk'Mip day school. Activities will also include storytelling and more. This program is designed for caregivers to stay and make memories with the kids. Celebrate Family Day in Keremeos! Feb 18/19 10 am - 4 pm Bring your family to the Museum and discover the families who built the South Okanagan. Search your family history ! Refreshments ! Prizes ! Come celebrate "Here's How We Play" Family Day on Monday, Feb 18 from noon to 4pm with a visit to the Ladysmith Museum. Enjoy vintage games, puzzles, entertainment and free snacks. Try board games - Chutes and Ladders, Parcheesi, Sorry - Do you remember Crokinole, Pick up Sticks and Jacks? Or try your hand at our Hul'qumi'num Mix and Match Word Game. Take in the new WWI Exhibit and watch some archival films. For more info call 250-245-0423. Hangar #3, 5333 - 216 St.
Fun for the whole family! Enjoy games, crafts and cool airplanes. Sit in a fighter jet, enjoy complimentary popcorn and hot chocolate and see our vintage aircraft fly by (weather permitting). Join the BC Farm Museum at the City of Langley's Family Day event at the Timms Centre, as we provide stories, artifacts and demonstrations on pioneer life in BC. BC is rich in history and heritage and the museum volunteers will share how farming was done, how households were run and the general life of our pioneers. Even some stories of local Langley pioneers that help shape Langley to be what it is today. Enjoy a free fun family scavenger hunt at the museum. Look through the permanent History Gallery to find clues, learn about Langley's past, enjoy a special treat and create family-themed crafts. Cortes Island families! Join us at the Museum from 1-4pm on Monday February 18th for our "Family Day Tree Dressing" in celebration of our island's most tree-loving species at risk. Write love letters to honour your favourite birds and trees, and decorate little effigies to tie onto our Celebration Tree. The act of dressing a tree binds us to it and celebrates the unique role that trees have in our local neighbourhoods. Let's share stories and songs about the medicine of trees and the sweet little creatures who depend on them for food and protection. Refreshments provided and everyone is welcome! We gratefully acknowledge the support of this event by the Province of British Columbia. Free Family Day Fun at the Maple Ridge ACT! Join the ACT Arts Centre on Family Day for a full day of free family activities. The Arts Centre invites members of the community to visit the centre and paricipate in fun activities such as arts and crafts, dance, clay play in the ceramics studio and lantern making. Come out to the Mayne Island Agricultural Hall and Museum for a 'Seedy Weekend.' Friday Feb 15th 7:30 pm see the film: "Seed: The Untold Story"; Saturday noon til 3pm, swap seeds, learn about the apple mapping project, view historic photographs taken by island settler John Aitken, visit the Museum and Barn and listen to presentations by amazing speakers including Tsartlip Elder STOL?E? John Elliott. Family Day will be a two day event (Friday 10am - 5pm & Saturday 10am - 3pm) in McBride with families coming into the Museum to work with Museum staff to learn the traditional skill of knitting a toque using a knitting machine. Kids and parents will work together to learn another skill taught at the Museum, and experience life as it was in our valley's history....and during the Family Day Event, admission, coffee, hot chocolate, cookies and even the toque you make are free! Come join our Nk'seytkn (Family) for a fun filled evening of food, fun and games. Join us for a wonderful night of Karaoke, dancing and fun filled laughter. Kids will be getting crafty while the adults can learn to make drums and share the First Nations teachings and culture. We are all one family at the Friendship Centre. Shxwuweli (Hul'q'uminum word meaning Relatives). Join us for a free Family Day Saturday Studio Workshop with Kwakwaka'wakw elder Sally Williams. Families are invited to bring translations for the word "family" to help create collage and mixed media on wooden panels and share messages of belonging and language to our mural wall in Art Lab. Celebrate Family Day with a unique experience. Have a family portrait taken on black & white film in our heritage turret. Photographer Thomas Nowaszynski of LighterCyde Film Lab will be on hand to share his talents. Please email programs@touchstonesnelson.ca to book your free 15min session. Happy Family Day everyone! Connect with Coast Salish culture and conservation for an exciting wintery day of plants, birds, art, and food. Hear from Coast Salish artists about their art, listen to stories, and walk nature trails with birding and edible and medicinal plant guides. A one-day event featuring a free, all-ages workshop on recording family oral histories, kids crafts and colouring, a film, and snacks! Come use our Selfie Station to take family photos, mark your family's origins on our world map, and celebrate your family! This event is a family art ?pop up studio? hosted by the Dawson Creek Art Gallery. There will be free art supplies to create with as well as free healthy snacks and refreshments. People of all ages are invited to come make some art and enjoy the company of friends and family! FREE admission to the galleries all day! Select students from within our school district will display their coding, robot and computer focused projects for the public. Organizations involved in coding and robotics will also have booths throughout the building to share their skills through hands-on activities. On Saturday, February 16 from 1-4 pm Two Rivers Gallery is hosting a Free MakerLab for Family Day Weekend. Drop by and try your hand at print making cards, check out our 3D printing demo and play with our 3D Doodlers. Free Sunday Open Studio to celebrate BC Family Day. Create a creature that expands to expose secret features! Free admission to the gallery all weekend. The Central BC Railway and Forestry Museum is Celebrating Families this Family Day, February 18 from 4:00 pm - 8:00 pm. Stop by and enjoy the lights and light displays throughout the 8 acre park, and take a ride on the Cottonwood Minitrain! Admission and train rides are FREE! Take a step back in time as you walk among the trains and heritage buildings, and warm up at the bonfires! This event is supported by the Province of British Columbia. All A'Board for some Family Fun!! The Granite Creek Preservation Society in conjunction with the Princeton and District Museum and Archives is excited to host a free family matinee movie at the Museum. On Saturday, February 16 at 1:30 pm we will be screening Charlie Chaplin's 1925 silent film, "The Gold Rush". Free popcorn, and hot chocolate with marshmallows will be served. Seating is limited. The Princeton Museum is located at 167 Vermilion Avenue, Princeton. Family Fun & Games at the Quesnel Museum! To celebrate Family Day the Quesnel Museum is offering free admission on Friday February 15 and Saturday February 16 from 12 - 4. Come and tour the museum, participate in a winter themed scavenger hunt, try on some vintage fashions and play some old fashioned family games. Free refreshments available in the Visitor Centre. Come and celebrate Family Day at the Revelstoke Railway Museum. Free entry, face-painting, crafts, healthy snacks and hot chocolate, and an opportunity to talk to a retired engineer in the cab of our steam locomotive. Celebrate BC Family Day with a big snow day at the Rossland Museum! Snow races, sledding tracks, snowshoe trail, sugar shack, hot chocolate, and treats - then come inside to warm up and do some fun, family activities and crafts. Tsawout First Nation is hosting a Family Day Event, with the support of the Province of British Columbia. Free event, come learn to weave cedar, and knit. There will be food and refreshments. The Salt Spring Arts Council celebrates kids and families through the arts, performance, and fun with our annual Family Day Celebration. Join us for crafts, snacks and face painting and the award-winning storyteller Anne Glover - she leaves communities in a merry tangle of string wherever she goes. Join us at the Shawnigan Lake Community Centre for the 6th Annual Family Day Event in partnership with the Shawnigan Lake Museum. Our theme this year is "It's About the Stories...great things happen to those who share them". Activities are free to all and include hand-on oppportunities for families to lean ways to share stories with puppets, felt boards and more. Crafts will include making your own Story Glove to take home for further story telling. We will also have a live performance from a special guest storyteller so don't miss out on this great opportunity to share the day with your family. Free admission into the centre, and free tours. As a special treat, we will also be broadcasting the All Native Basketball Tournament for the public, come show your community spirit and make some posters to cheer on our teams. Drinks and snacks available for all. Family Day at Creation Station! Join the Smithers Art Gallery and the Bulkley Valley Museum this Family Day - Monday, February 18th - from 10:00 am - 12:00 pm at Creation Station on Railway Avenue as we lead you in a family art activity that the whole family can participate in. Spend the morning getting messy and let us do the clean up! Watercolours, Pastels, Paper and Glue. This drop in program is FREE and designed for families! See you Monday morning. Learn how families lived in a lighthouse and in a small cottage 100 years ago. Plus explore the Sooke Region Museum new hands-on artifact kit! Sample some traditional family favourite food and drink! What did families do for fun before TVs and video games? Boardgames! Spend quality time with your loved ones just like families would have done 100 years ago at this free family day event. Celebrate Family Day by experiencing what life would be like 125 years ago. Do some old-fashioned chores, a craft and sample some baking from the woodstove. The event is free and is accessible to all (the site, Park washrooms and main floor of the farmhouse are wheelchair accessible). Spend your Family Day Saturday, February 16 from 11:30 - 3:30 at the Trail Riverfront Centre and fill your very own Family Time Capsule! Learn more about your family, design your own family crest, take a family photo and capture this moment in time for years to come! Spend a dinosaur-themed Family Day at the Dinosaur Discovery Gallery in Tumbler Ridge! Try your hand at making fossil replicas, cleaning fossils, seeing how fossil impressions are made, and other fun, hands-on, museum-themed activities! FAMILY DAY FREE ADMISSION AND TOUR AT MOV Join us this Family Day and receive complimentary admission to the Museum of Vancouver, and free tours of the exhibition Haida Now (at 11:30a & 1:00pm). Take a walk on the wild side, visit the Wild Things exhibition and experience the wonder of a close encounter of the wild kind. Explore the Haida Now exhibition on a free guided tour (11:30a & 1:00pm) and discover the wily ways of Wasgo the Sea Wolf and many other captivating Haida legends, including the Bear Mother. Learn about Vancouver's past from 1900 to 1970 by visiting MOV's History Galleries. An experience the entire family will enjoy! We gratefully acknowledge the support of this event by the Province of British Columbia and the British Columbia Museum Association. Family Day Coast Salish Painting with Maynard Johnny Jr. The Bill Reid Gallery is celebrating BC Family Day with a day filled with free family friendly activities including drop-in painting with Coast Salish artist Maynard Johnny Jr., storytelling and button making. Haida Family Day 2019 Gathering with Food, Drumming & Singing, dancing, weaving, family tree info, and door prizes. All Ages, Everyone Welcome. In celebration of Family Day, join us to discover the secret lives of artworks! Together, we will consider where artworks live when they are not on display, how they are cared for, and who chooses to display them, as explored in the current exhibition?A Curator?s View: Ian Thom Selects. Free for children 12 and under, when accompanied by an adult. Free for Members or with Gallery admission. Family Day at the Hall! Monday, February 18th is Family Day at the Hall. If you're looking for a fun and inspiring outing, the BC Sports Hall of Fame is your ticket! From 11am-3pm come enjoy games, a family day themed scavenger hunt, create your own pennant craft, and complimentary snack! Bring a family member and join us at the Vernon Museum for Family Day Games! There will be activities for all ages, with food, fun and chances at great prizes. Connect with Nature. Inspire our World. Join the Bateman Foundation for free admission to The Robert Bateman Centre on Monday February 18th in celebration of Family Day! Come experience our interactive art gallery that features over 80 pieces by world-renowned artist and naturalist, Robert Bateman. You can also experience a free sketching class that utilizes Robert's basic sketching principles and the teachings of an artist and naturalist. Classes will be offered at 11:00 a.m. and 3:00 p.m. Admission to the Gallery is free all day. The Royal BC Museum is your museum. Join us on Family Day to share the museum with your loved ones. A variety of activities and exhibits are available for all to enjoy. Celebrate BC Family Day - Family Studio at the Audain Art Museum February 18, 2019. 12 pm - 4 pm Come and join the celebration of BC Family Day, at the Family Studio. This drop-in hands-on art making workshop with feature a range of activities inspired by Contemporary First Nations works in the museum?s Permanent Collection. Create a paper sculpture exploring combinations of 2D and 3D spaces, an artistic button and strike a pose in the 'Cabin Photo Booth'. Refreshments will be served throughout. Free and suitable for all ages. Come and make "merrie" with your family at the Museum this Family Day! Enjoy free refreshments and admission to the "A Merrie May: The Role of Costume in Spring Festivals" exhibition, where you can make your own mask and then create a keepsake photo of your visit!